All replacement glazing comes within the scope of the Building Regulations. Anyone who installs replacement windows or doors must comply with current thermal performance standards. C.S Construction Ltd, established building contractors in Leicestershire, are registered with FENSA and the National Federation of Builders. Having completed many successful double glazing projects within Leicestershire as well as Warwickshire, Staffordshire, Northamptonshire and Birmingham area, we have the experience and the expertise needed to install your new windows or doors. 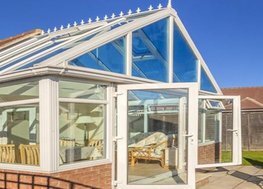 Established building contractor in Hinckley we deliver a wide range of construction services related to double glazing or building extension and renovation. We pride ourselves in our wide range of skills as Midlands builders, and offer a complete building service through our professional experience from domestic construction to commercial constructions.